Yeyyyy.... Finally!!! I'm posting my 1st South-Indian dish :) A healthy option of 'Rava Idli' for South-Indian Food lovers!!! Given here is a recipe of Microwave version, which is quite quick and almost effortless... You can make it using a normal Idli Steamer too. 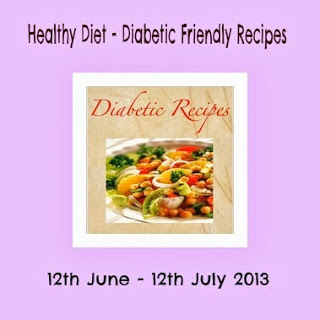 - Take all the ingredients of batter in a big bowl and mix them well. - Add a tbsp of water at time if it needs more to make a batter with pouring consistency. - Heat oil in a small pan (tadka-pan) and add urad dal, chana dal and mustard seeds into it. - Once dal are golden-brown in color and mustard seeds splutter, add cumin seeds and hing. - When it stops crackling, pour this to batter. Mix lightly. - Grease microwave-proof idli plates. Microwave 1/4 cup of water on base plate of idli maker. - Pour a tablespoon full of batter into each idli mould and arrange on base plate. - Cover it with a lid and microwave it for 4 mins. - Take them out and serve hot!!! - If not using microwave idli maker, it can be steamed using regular stand too. You need to steam it for approx 10 mins. 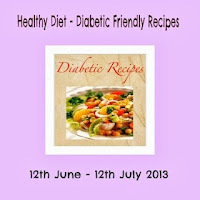 Linking this dish to Priya's Easy n Tasty Recipes - Diabetic friendly event!! !